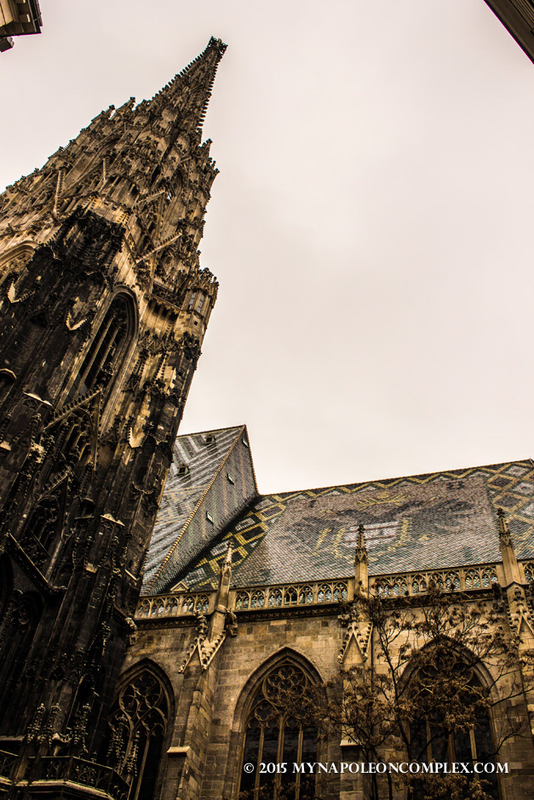 Hi, guys, today I’m going to continue with the rest of the sights we saw on our weekend in Vienna, excluding the famous Vienna Christmas markets and what we ate, which will get it’s own separate post! 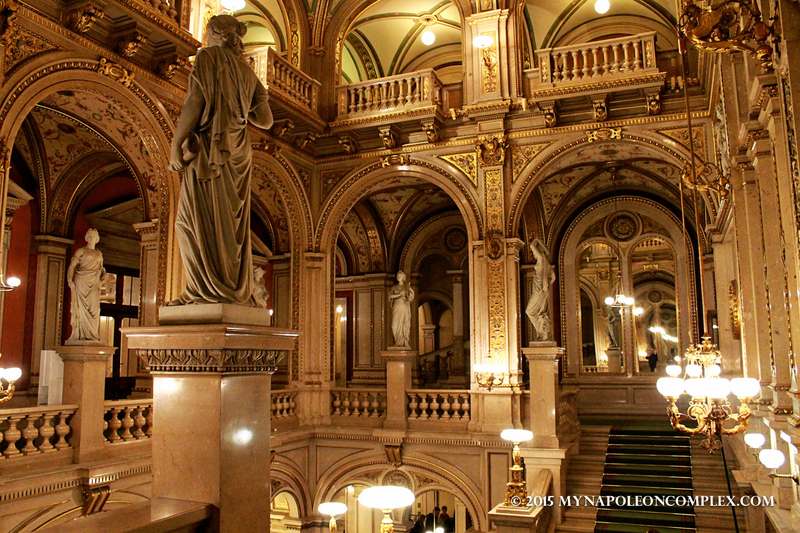 On Sunday, we took a tour of the Vienna State Opera (Wiener Staatsoper). 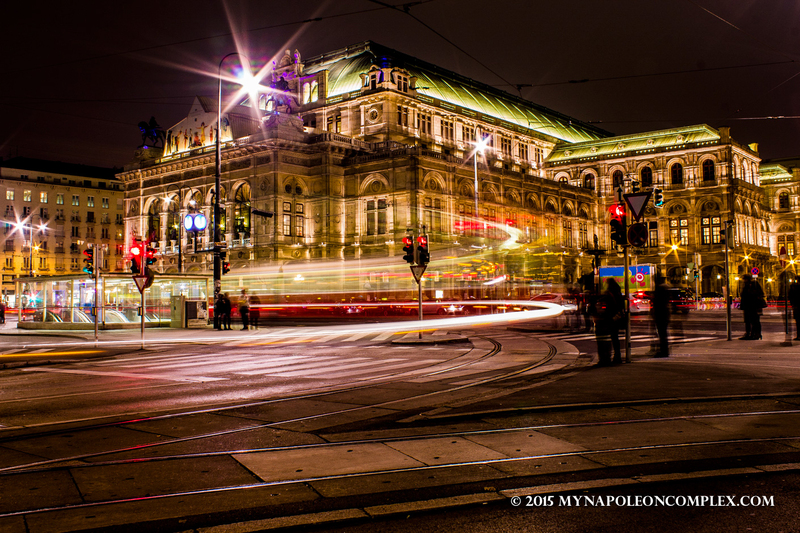 Ideally of course, we would have gone to see an opera show, but our schedule was just too full (not to mention Vienna opera tickets are not exactly budget friendly). I’m glad we took the tour, though, because it was fantastic. They offer the tour in many different languages (including Chinese), but for some reason they didn’t offer it in Italian, so we took it in Spanish so that our friends could maybe understand something. The tour took us to different rooms throughout the opera house, explaining some of the history in every room. We also got a behind-the-scenes look at how they prepare each opera, from how they have their own artisans and costume designers that make every single piece used during the performance, to how they set up and break down the set every single night (because no one performance plays two nights in a row). We also got to sit in the seats and go behind the stage to see the set being set up for that night’s performance. The singers do not have any mikes, so they have to be able to sing loud enough for every single person in the room to hear perfectly (another reason why no performer can perform two nights in a row). The Chandelier, which, by the way, is cleaned by hand! 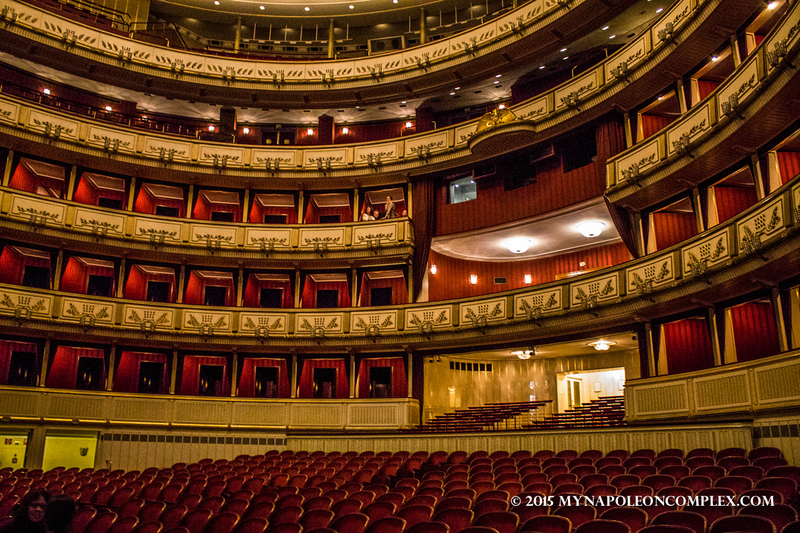 The Vienna State Opera House also hosts a world-famous debutante ball every year (around this time of the year, I think), that is broadcast throughout Europe. The debutante ball is open to anybody that pays a relatively small fee, can dance the Viennese Waltz to the left, and is within the required age. Really, the tour was very informative, so it’s something I definitely recommend doing if you have the chance. The only catch is that they only do tours on specific dates and times, so you have to check their website for dates and you have to go at least an hour in advance to get your tickets. 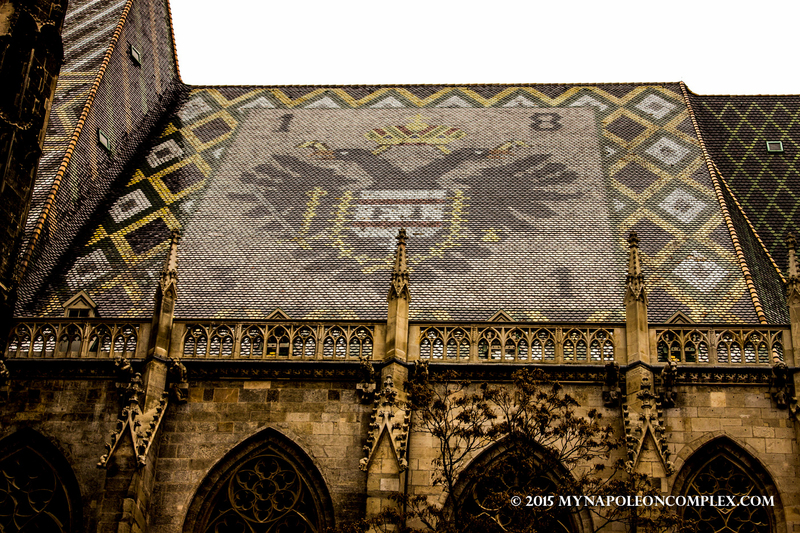 We obviously also passed by St. Stephen’s Cathedral (Stephansdom) and Stephansplatz. The church was very beautiful, of course, but we couldn’t explore it at length because there was a mass going on when we passed by. We did get to see a chapel though with a Jesus statue whose beard, according to legend, continue to grow even today! One of the few, not so great pictures, of the inside. 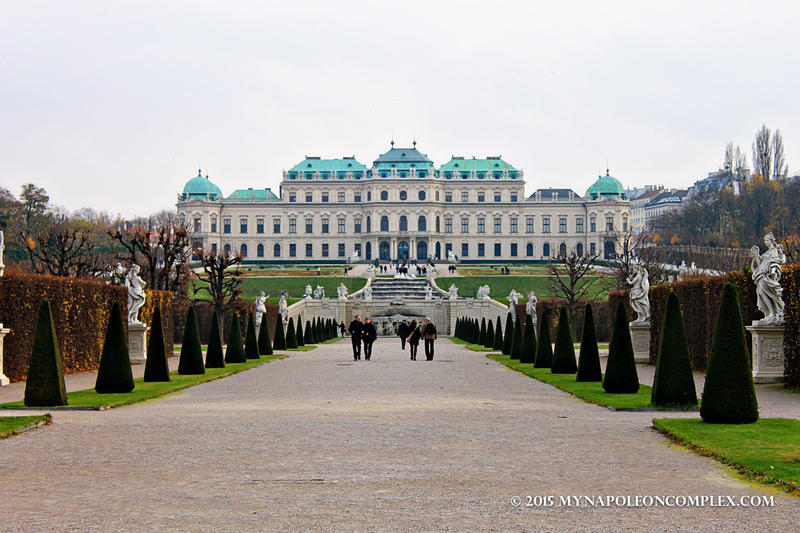 On Saturday afternoon, after lunch, we headed to the Belvedere, yet another palace that today houses the biggest Austrian collection of art. 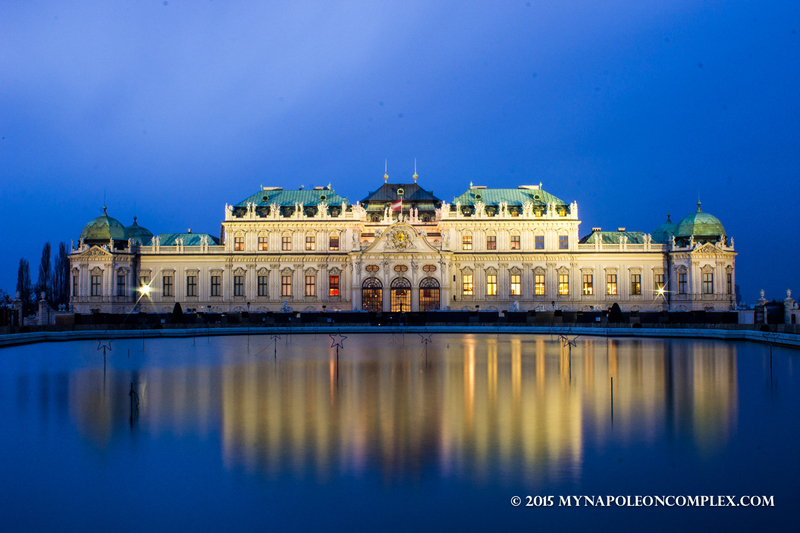 We didn’t go inside, since our purpose was more to capture a picture of the palace during the twilight hour. We had hoped that the Christmas lights on the lake would be turned on, but I think we were a few days too early for that. 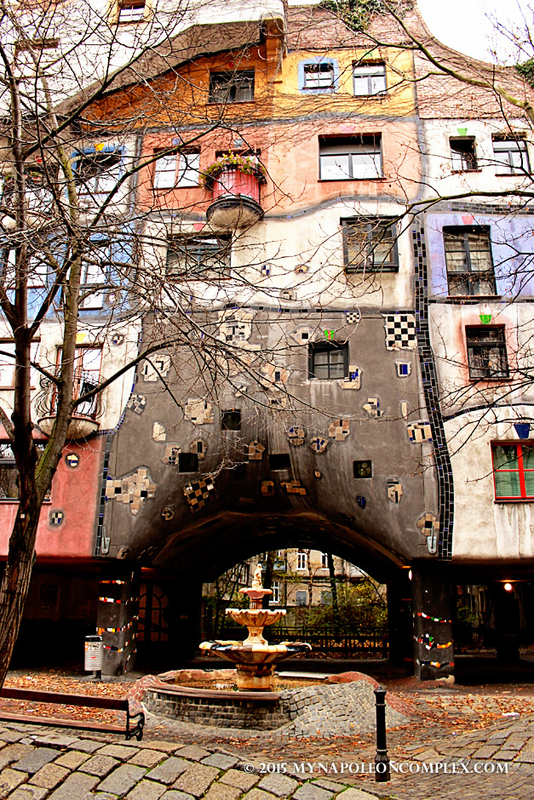 On our last day in Vienna, we took a little detour to Hundertwasserhaus, possibly the weirdest apartment building I’ve ever seen. 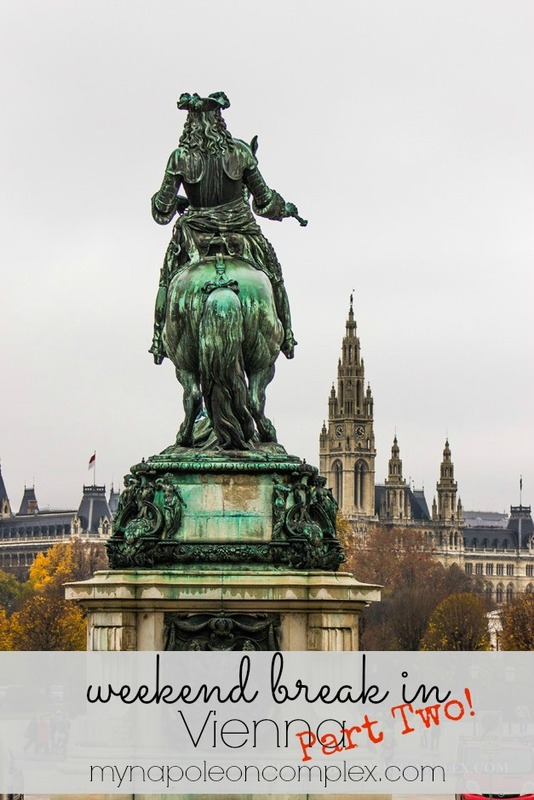 I originally saw it on Kevin & Amanda’s post about her time in Vienna (do I even really have to tell you how amazing Amanda’s blog is? She’s like my blogging idol), and I definitely made a note of it to see it for myself. Luckily for us, it turned out to be not too far from our hotel! Honestly, it looks right out of a Dr. Seuss book! 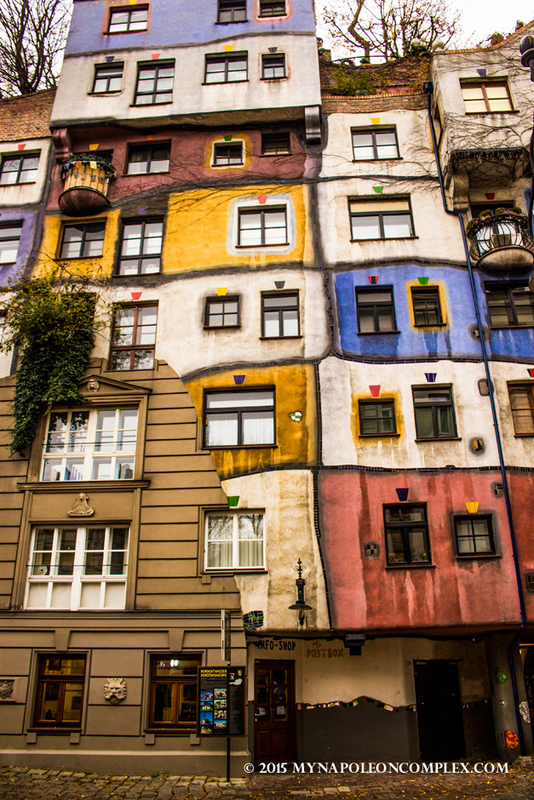 Apparently, there’s even a waiting list to live there. I can only imagine what it looks like from the inside! 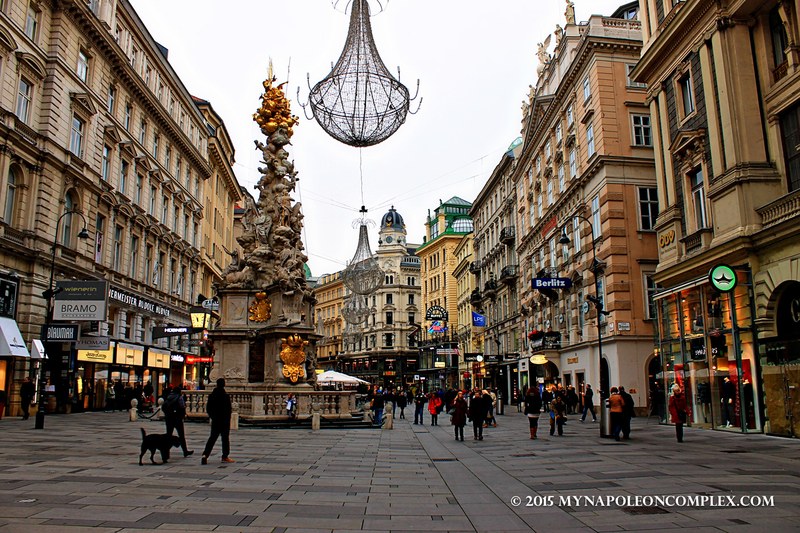 Of course, we also spent a lot of time just walking around and enjoying the streets of Vienna. At one point we got lost looking for a chocolate shop and stumbled onto a cute little Christmas market! 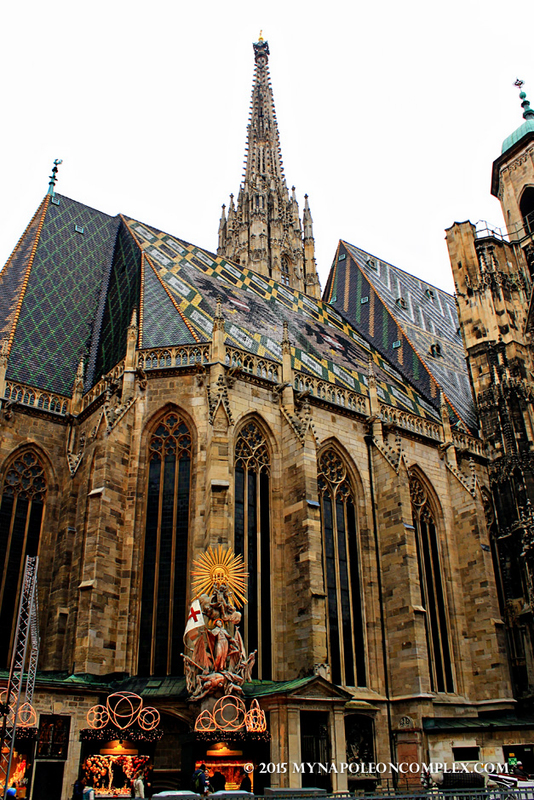 Vienna is absolutely gorgeous, my only regret is that though most streets had their Christmas lights ready, they hadn’t been turned on yet! 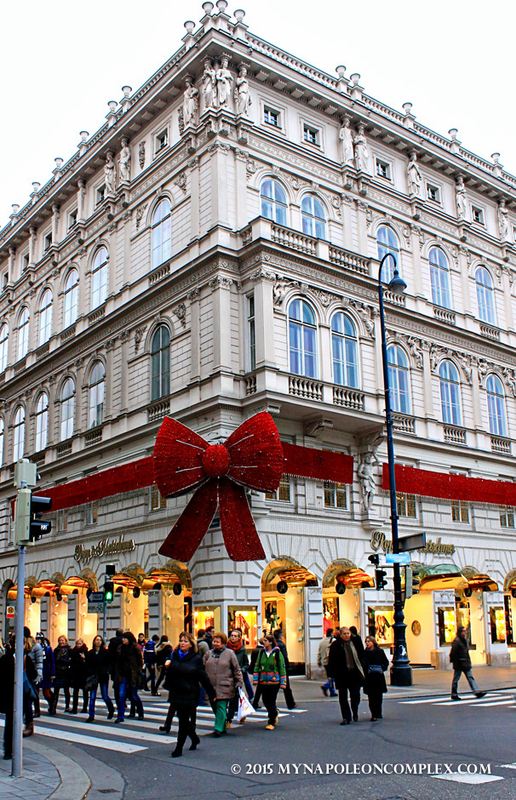 Every time I passed by this shop with a bow I went crazy. How cute! 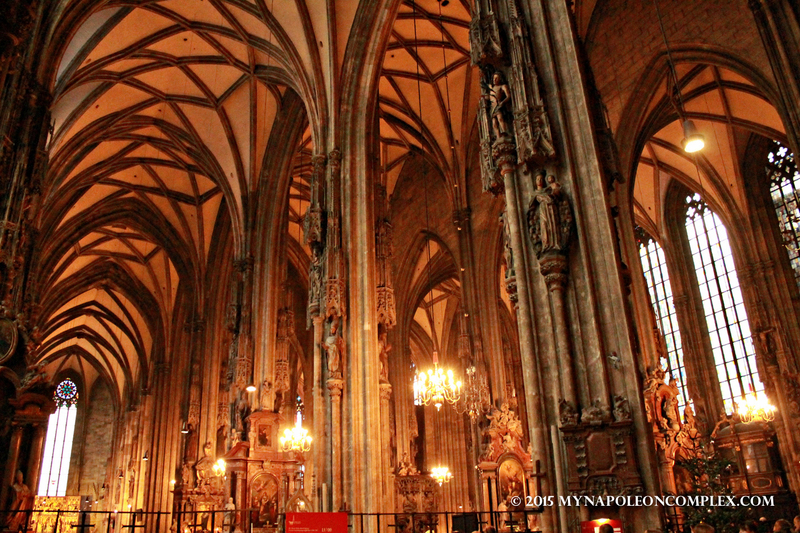 City Break: A Weekend in Vienna, Part One!